The Wandering Ascetic cruise along a decadent highway with a lateral, enjoyable, and pleasantly intense piece of work. The Wandering Ascetic are a Singapore-based four-piece who are about as honest a metal band as is humanly possible. And how do you categorize metal as punchy and raw as the ten tracks found in Crimson? You could call it black metal, death metal, or even box it in the genre of thrash. But given The Wandering Ascetics‘ display of bone-breaking sincerity, they can’t really be fully pigeon-holed into any of these. Their songs are fluid and often groovy pelts of rage which draw from the gnarlier sounds of death and black, but approach listeners in a much steadier format. 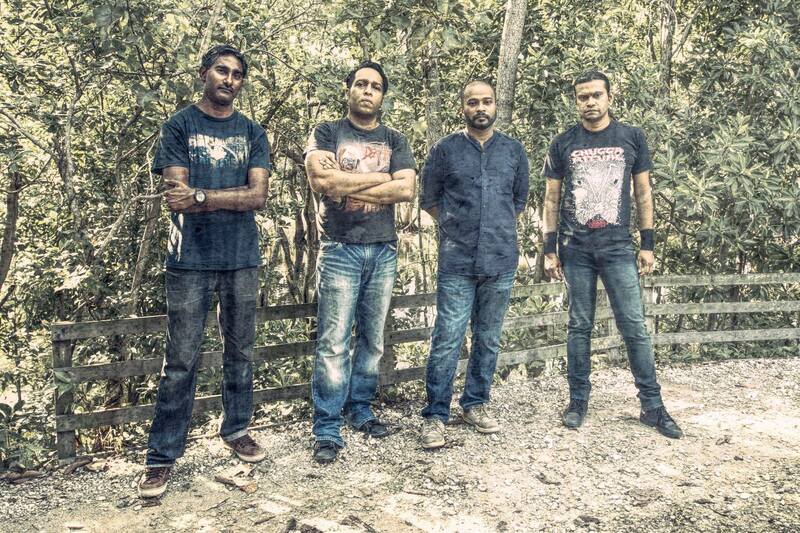 Also worth noting is that two of the members (guitarist and vocalist) originate from the iconic Southeast Asian ‘Vedic metal’ band, Rudra. Look them up if you’ve never had the privilege. Savage is not the word. It’s worth keeping Rudra‘s two-and-a-half decades of track experience in mind when listening to this. For my ears at least, the music of Crimson hearkens strongly back to the early 90s post-grind chapter or Carcass‘ brutal legacy. The vocals in particular seem very Jeff Walker inspired, and it’s a solid foundation upon which the band are able to work their wicked ways. Though the voice tends to draw from a widely used template, it is an element worthy of extra mention due to its consistent ferocity across the album. Through the voice, we have a front to the music which sufficiently marinades the relentless chug of guitar, bass, and drums. Tried and tested, it might be, but it does work and the proof is in the sound. If you want further assurance that The Wandering Ascestic are an amicable force in metal, pin your ears back for songs such as fourth track, “The Gods Bleed”. The foreboding melodies, neat bass work, and generally ominous tone contribute to raising this album above the bar. And yes, those vocals again show strength in their doggedness. Listen onward and you can also absorb the full impact of the band’s thunderous production in “The Will to Live”, and the doom-ladled finale of “Orang Laut”. Amidst the thematically level tone of this record, you will hear the odd solo, break in pace, and sidestep into the melodic. But through and through, it’s a constant barrage with a clear mission statement. The Wandering Ascetic draw from some classic subterranean conventions of metal and use them to deliver a neat little package of undiluted heaviness. Every once in a while, it’s good to sink into the formulaic abyss, so you might as well do it at the mercy of a band who blatantly care about what they do. In this respect, I regard The Wandering Ascetic as a band who stick to their guns, and “Crimson” as the proof that they made the right choice in doing so. They subsequently deserve a fair slam of credit. And those looking for a good hearty dose of the ugly stuff with no compromise, need look no further than this. Next PostPlasticBag FaceMask - "Whited Sepulcher"